Do you like stuff? So do we! Stuff for the mind, for passing time, for sharing, for yourself, for fun. Mariva's Guide brings you interesting, innovative, beautiful, entertaining and useful products, web sites, articles and images -- in other words, this, that and the other thing. 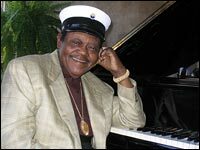 Thank goodness Fats Domino was found alive and well after the Katrina disaster in his native New Orleans. He was found in his home in the Ninth Ward, although some say he was actually found on Blueberry Hill. Domino is 78 years old, and despite losing his home, he’s in good spirits and still making music. He’s donating the proceeds from his latest album, Alive and Kickin’, to the Tipitina’s Foundation, an organization dedicated to rebuilding the music culture of New Orleans. On NPR’s All Things Considered, Domino demonstrates the rhythmic and tempo difference between rhythm and blues and rock and roll, a shift that occurred in popular music during the ’50s.